Mike T. Cole is so country he wasn't raised; he was reared. He was blessed with the kind of upbringing city kids only watched as dramatizations on TV in after school daycare. Total freedom to be a solitary boy in the woods was all his. Mike Cole spent long days playing, patrolling, hiking, imagining & investigating the landscape surrounding his home in North Central Pennsylvania. At dusk, he would wander back to the house his father built, and his mother filled his belly with venison & potatoes (or Hot Pockets if she was at work). Mike Cole had no bedtime, so he stayed up most nights fashioning tiny weapons with a pocket knife, drawing forest animals on pieces of wood or watching what he called "Home Box Office". Eventually, he would fall fast asleep and dream of scoring a jillion soccer goals or being attacked by werewolves. This is the way it was for years as he grew. The land was his constant companion, and they became bonded for life. The day arrived for Mike Cole to leave the country for the city: Philadelphia. He went to the head of the class at Tyler School of Art, secured a job as waiter at "Macaroni Grill" where he mastered writing his name upside down on napkins, and became "the man behind the curtain" at home except that he was not "The Wizard of Oz" but a broke college student whose crummy apartment didn't have enough bedrooms, so he partitioned the living room with a bed sheet. Inevitably, he was beating the art babes off with a stick, one of whom was his Italian American Kryptonite genius and became his wife ten years down the road. Mike Cole accomplished all this while subsisting solely on canned ham and Jif! Also, he majored in painting. Mike Cole recently returned to his home in Philly after two years in California. His work has branched out from painting into photography, installation and beyond (though his wife cannot comprehend why he isn't just painting her as various Venuses from art history). He misses the simple life of the country everyday and is drawing up plans for a hidden retreat to be built in the hot bed of his impending mid-life crisis. 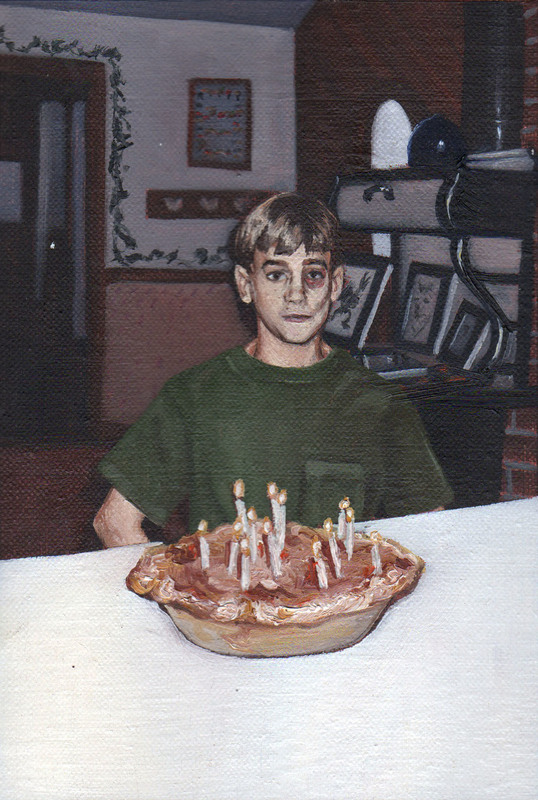 Portrait of Mike T. Cole on his thirteenth birthday.